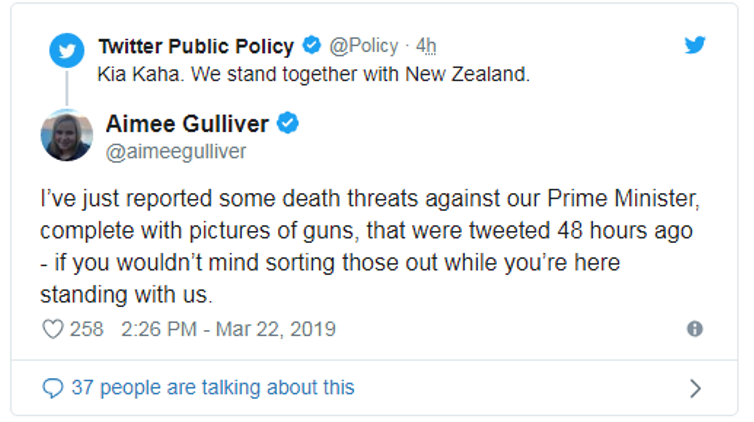 Police are investigating death threats sent to Prime Minister Jacinda Ardern on social media. The New Zealand Herald understands that the post had been up for more than 48 hours before the sender's Twitter account was suspended before 4pm after it was reported by various people. A police spokeswoman told the Herald: "Police are aware of a comment made on Twitter and are making inquiries." The posts were pointed out to Twitter itself after the social networking giant tweeted a message of support following the two Christchurch mosque attacks on March 15 in which 50 people died. The message came at 1.48pm today, closely after the nationwide two-minute silence for the mosque victims. Social media platforms have been criticised after a livestream video showing the attack at the Al Noor mosque was able to be uploaded and shared. The day after the attack, Twitter said is was "monitoring and removing any content that depicts the tragedy, and will continue to do so in line with the Twitter Rules". It also recommended that people report Tweets that break any of the social media company's rules. Facebook said in statement that the alleged shooter's livestream was viewed fewer than 200 times and not reported until 12 minutes after the 17-minute broadcast ended. The company said the video was viewed about 4000 times in total before being removed and that its artificial intelligence was part of the problem. "While [AI's] effectiveness continues to improve, it is never going to be perfect," Facebook said in a statement on Thursday night. "People will continue to be part of the equation, whether it's the people on our team who review content, or people who use our services and report content to us."